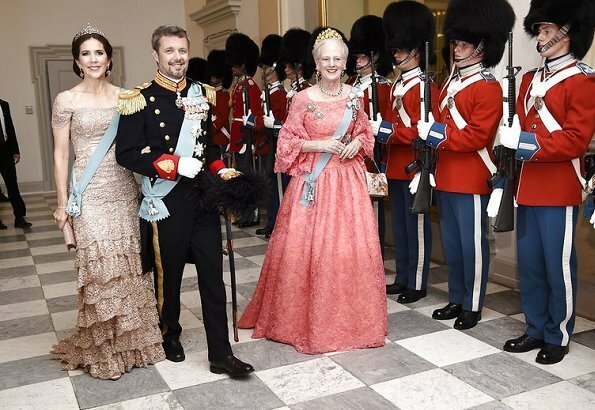 On the occasion of the 50th birthday of Crown Prince Frederik of Denmark, Queen Margrethe hosts a Gala banquet at Christiansborg Palace. 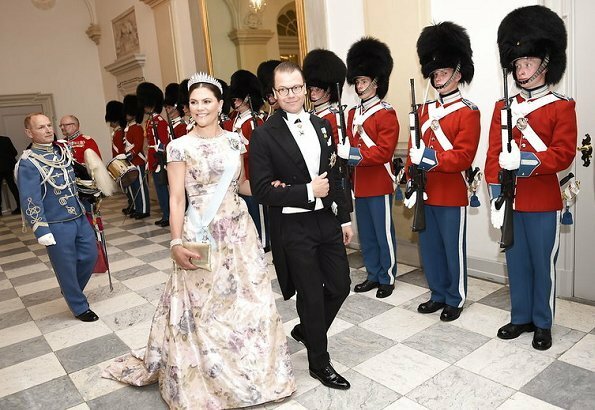 In addition to Danish royal family and Danish guests, members of other Royal houses attend the gala banquet. 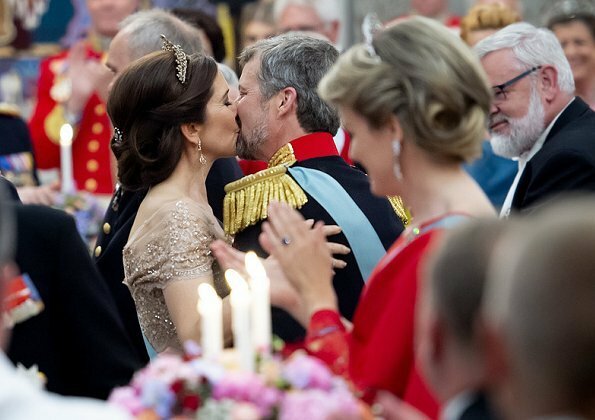 The Danes LOVE having big tiara parties for birthdays, especially for the Monarch and the consort, and now apparently for the heir. Mary and Matilde are my favorties. They look amazing! Nice to see Joachim's son. Is this probably his first gala banquet? His grandmother also gave him a special, semi-formal birthday party celebration when he turned 16 or 18 as I recall. I agree. Nice photos of her elsewhere. i want to see more pictures, please. Nobody from UK? What a pity! 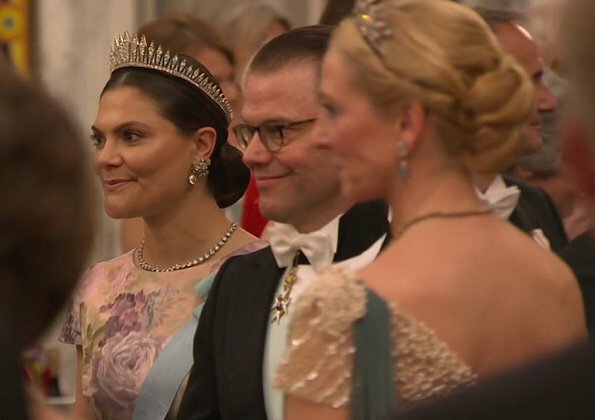 I'm guessing that the Royalty guest list was limited to the Scandinavian and Benelux countries, and the Greek cousins. Besides the UK, no one from Spain either. Beautiful dress on Mary. The tiered look of this fabric is just exquisite! 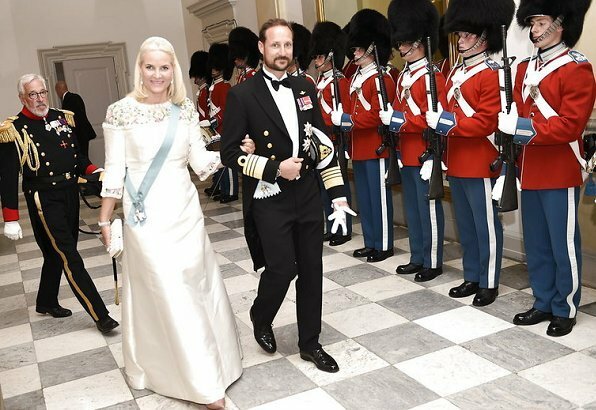 My other two favorites are Mette-Marit in pretty white with floral neckline and Mathilde is regal in the one shoulder red dress. Marie Chantal Miller has changed her face...some aesthetic treatment. Marie Chantel, her face is not healty, maybe she has to takes som medication. that must be the reason. thank you for the extra pictures. nice. IS THAT MARIE CHANTEL? difficult to recognise. 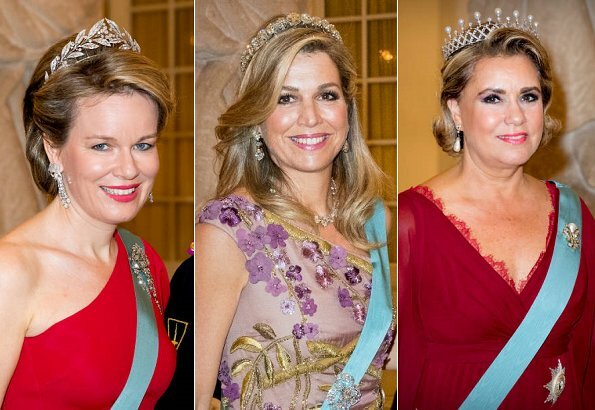 I like my Queen Mathilde, but want to see more pictures of everybody. I had to look at that picture of Marie Chantel several times, I recognized him but not her at all. What did she do to her face? The "Luxembourgs" seem to be here, to, I can see MT + husband in the back of the pic from Mathilde and Philippe. but unfortunately also didn't find a much better pic on other websites yet. MTs dress seems to be very nice, too. Wonder if Stephanie and Guillaume are there, too. 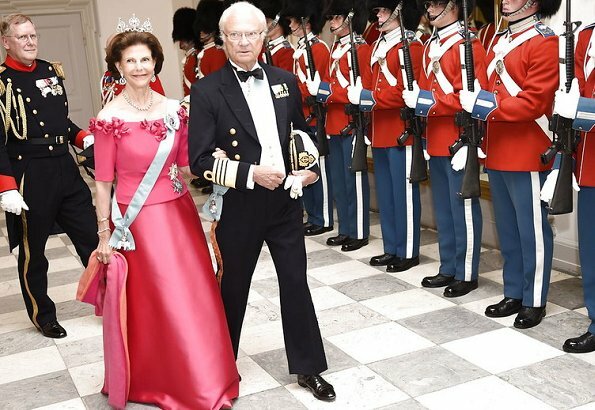 I don't recognize Queen Silvia's tiara. Is there anybody who knows anything about it? Wow! Mathilde in this red robe! Breathtaking! 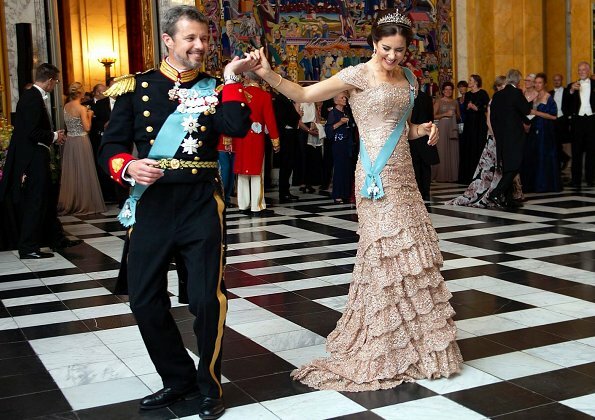 Queen Margrethe's gown is absolutely ravishing! With her upswept hair and festive tiara, she looks her regal best -- her flair for dramatic dressing on full display. Well how wonderful we have a full range of jewelry and beautiful dresses. Must say every Lady and Gentleman in this line up really outdid them selves.Outstanding. It's funny how one day Maxima and WA are in Luxembourg with MT and GD Henri (after 3 days), and the next day they are all seeing each other again in Copenhagen. So much quick travelling. Good thing these countries in Europe are not too far apart from each other. It's not Marie-Chantal but Theodora, Paul's sister. 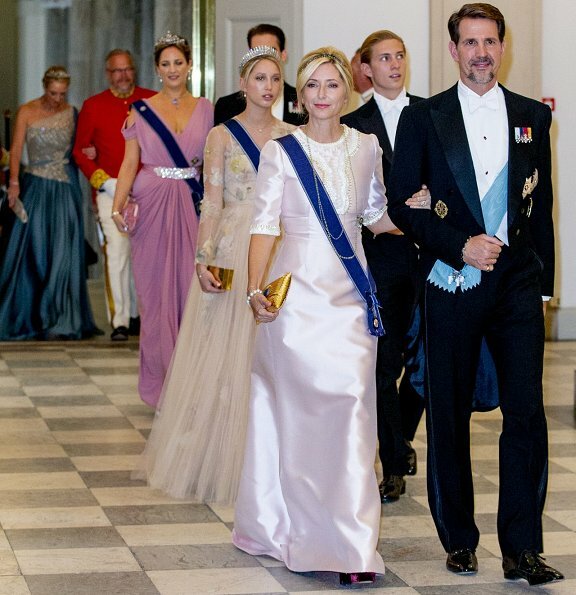 NO, that IS Marie-Chantal and behind her … the daugther Olympia! 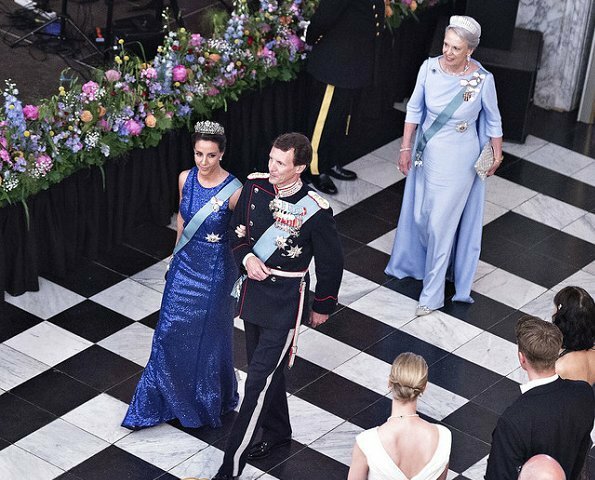 I haven't really a WOW dress, but a dress I don't like, is Marie's blue dress, the colour is absolutely lovely, but the rest is boring in a long t-shirt shape and too narrow to be suitable for the event together with a Prince Joachim dressed in pompous uniform with medals, just my openion! She needs a stylist! Marie-Chantal and her daughter Maria-Olympia, just about as royal as I am! @Geli - how wonderful, you are a member of a ruling and a former royal house. That must be something! Good for you! Which one are yours? Victoria, it dépends from 1 picture to the other. Maxima looks TIRED. The nicest are Silvia and Mathilde. Anyone know who represented the UK? Benedikte is the winner for me. I also like Victoria's dress and would like MM if it were better fitted. Margarethe looks fabulous. 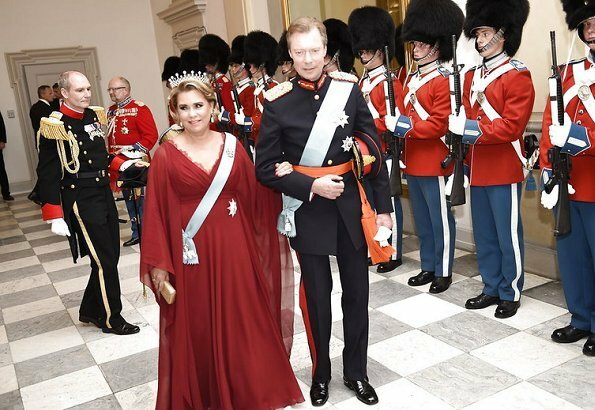 Königin Silvia trug das rote Kleid, ebenfalls mit dieser Tiara, beim letzten Staatsbesuch in Deutschland. Es sieht allerdings so aus als hätte sie einen anderen (etwas kürzeren) Haarschnitt? 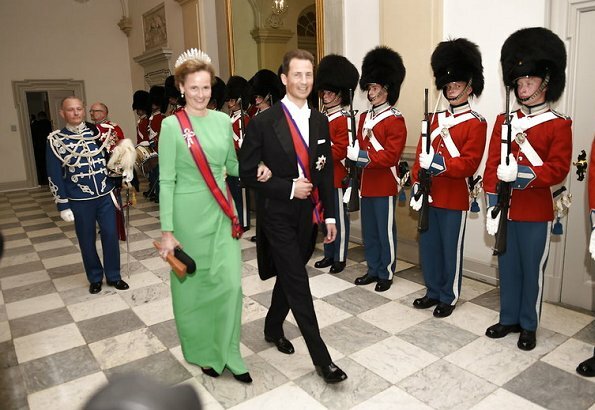 Lustig, dass sich die Niederländer und Luxemburger nach dem Staatsbesuch schon wieder getroffen haben und schön zu sehen, dass nach dem Tod von Prinz Henrik in Dänemark so schön gestrahlt wird! 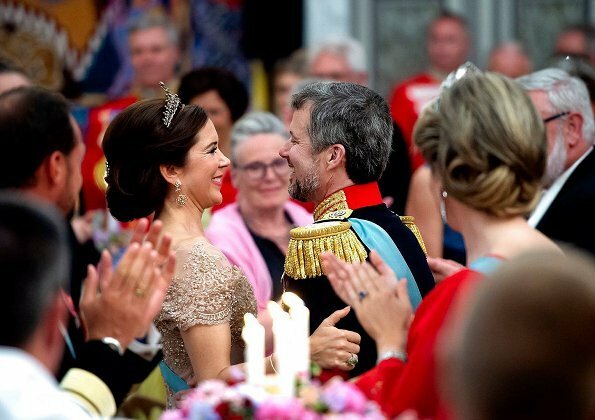 It is very impressive to see all royal couples together to celebrate Prince Frederik of Denmark's 50th Birthday. I like them all here! Winner Mary, near behind Victoria and Benedikte. 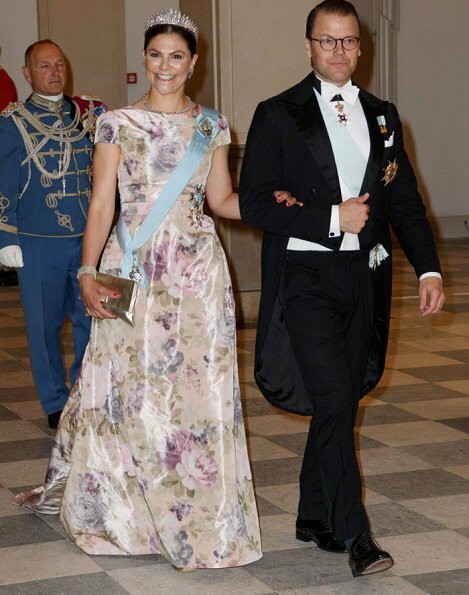 Maxima´s dress is lovely, but tiara hair a bit blaah, that beautiful diamond riviere tiara would have deserved better up doe. Ik mis het Griekse koningspaar!? 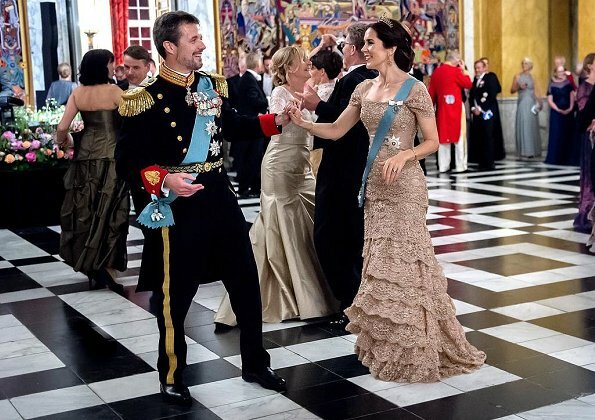 So many beautiful Gala Gowns Tiaras and a lot more jewels ,So many happy faces, men and women alike leave it to the Danes they know how to PARTY.Prince Frederik turned 50 this only happen once in a lifetime. So is it Marie Chantel? I read on here that it might not have been. 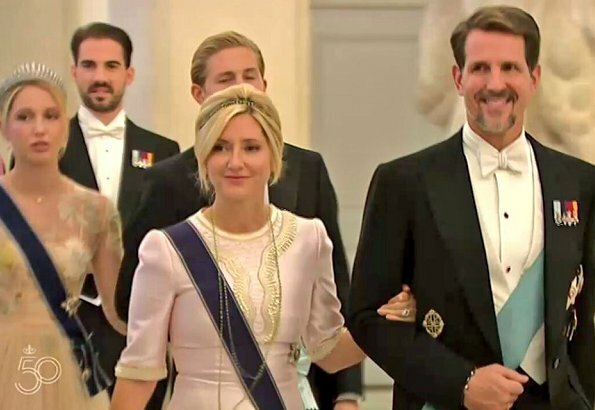 I'm going to agree with Geertruida that that is Princess Theodora on Paul's arm, not Marie-Chantal. And, yes, that is Olympia behind them. Perhaps Marie-Chantal couldn't make it to the event. You are not right, theodora is behind ! Paul and M-chantal ; Olympia and his brotherand Theodora and her brother Philipos ! Very elegant ladies. Frederick and Mary are a very loving and strong couple. Marie's blue dress is very flattering on her. 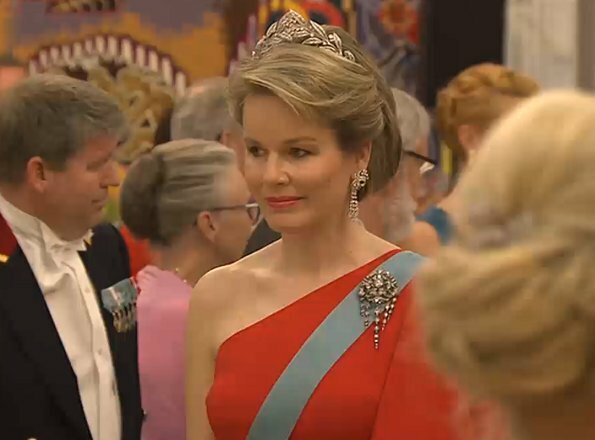 Queen Mathilde is the epitome of elegance and poise. Her tiara to her gown to her shoes to her make up is 10 out of 10. It is MC, but the photo is very bad and odd. I saw better pictures in Semana and she looks there like always. All the ladies and gentlemen look wonderful. Everyone looks great! Mathilde resembles a childhood friend of mine, so I will probably always be subtley partial to her. 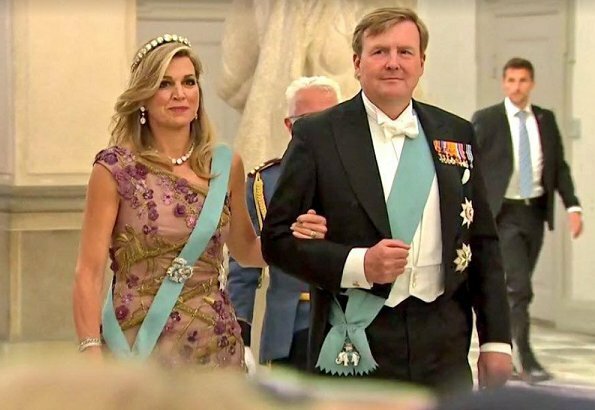 Maxima and Willem Alexander have seemed a little tense in pictures all week, is something going on behind the scenes? Maybe Marie Chantal is doing a little 'penance,' Pavlos had a sheepish look in one of the photos. Marie's gown is lovely, but the strong flash of the camera didn't do it justice. For Margrethe as Monarch, hostess, and mother of the guest of honor her appearance is perfect! The royal ladies all look fantastic. The wannabes - Marie-Chantal and Maria "I cannot close my mouth" Olympia look exactly what they are, wannabes. 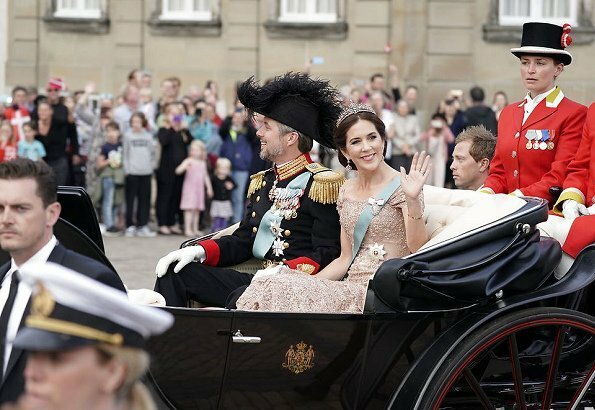 Crown Princess Mary - one Word: amazing! 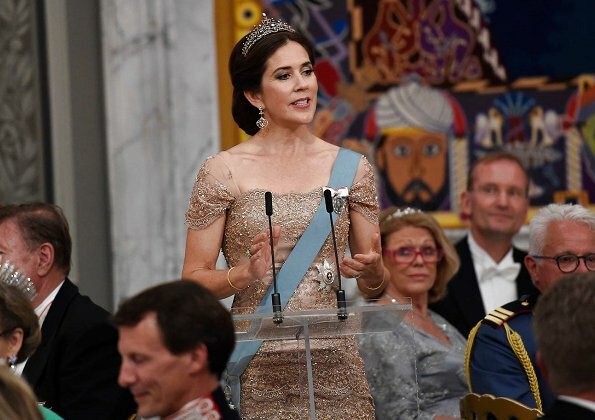 Love the other dresses too, but no other Queen / Princess is shining so wonderful as Mary does this evening! Das muss eine rauschende Ballnacht gewesen sein. Der Adel tanzt schließlich so gerne. Alle haben sich fein gemacht, um das Geburtstagskind zu ehren. Marys Rede an ihren Mann hatte die richtige Mischung von Gefühl und Humor. Tolle Bilder - Danke Hellen Electra! 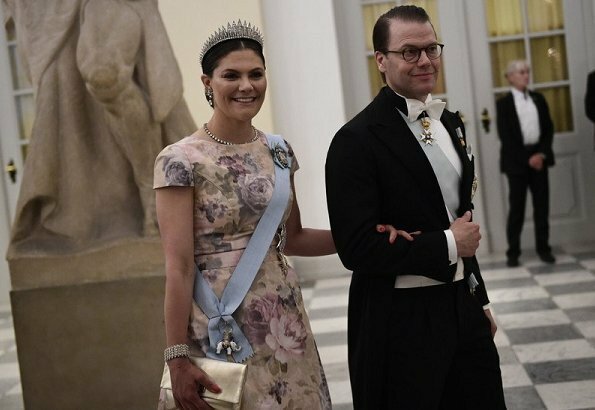 I love the dress on Victoria, with little sleeves and in May, far better than for the Nobel festivities in December. The winner must be Mary, she is a beautiful woman and the dress... Wow! Please, M-C stop the fillers (or whatever you are doing). Mary is stunning! Wishing them both continued happiness! All the royal ladies look good even Victoria with a little too stiff forehead ;) And even tho some off you complains about all the ladies who doesn't fit your taste of clothes I salute them. I love, love, love that they are individuals. Think how boring it would be with all them dressed the same way just to please you gals. 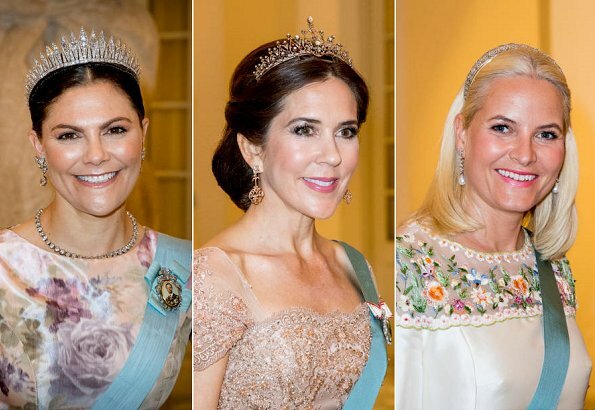 SO Max, Mette-Marit, Margrethe, Benedikte bring it on! Not true. The royals get their first tiara when they get of age, usually at age 18. In the UK, women don't normally wear tiaras before they get married. In Scandinavia, that is not true though. Victoria, Madeleine and Märtha Louise for example started wearing tiaras when they turned 18. Mary looks magnificent! Absolutely perfect from head to toe! Love everything. 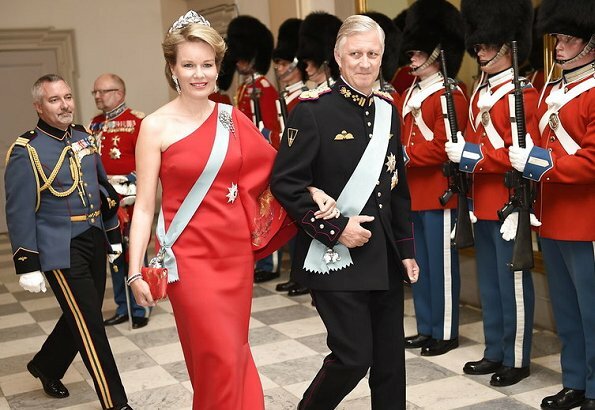 Benedikte looks very elegant, her gown is beautiful and the colour very flattering. 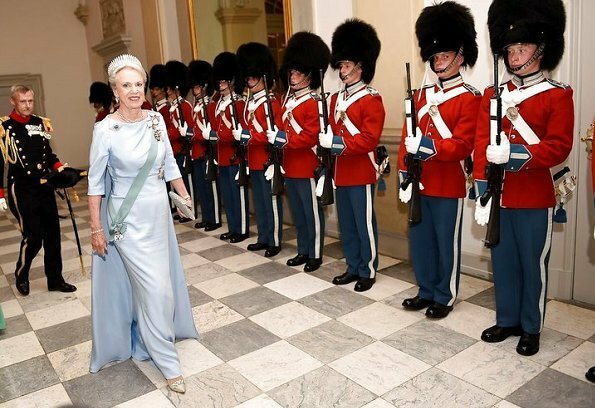 I like Queen Margrethe gown, however, I am not a fan of the tiara she is wearing, anything/nothing would have been better. Queen Silvia, Victoria, Grand Duchess MT, and MM all look very elegant, their gowns and jewellery lovely. I am not a fan of one sleeve dresses, however the colour of Mathilde's gown is very flattering, and in herself she looks radiant. Marie's dress is horrible, it looks poorly made and tacky. Schöne Bilder , Mary ist wieder eine Augenweide ! Mary for me, stunning love the color. Mathilde also looks lovely also. Marie looks is not nice at all.